It's hard to believe that in two weeks, 5,000+ fellow Citrix users will be descending upon the city of Las Vegas and taking over the Sands Expo thanks toCitrix Synergy 2016. The fun of Synergy kicks off on May 22nd this year with the official kickoff happening May 24th and continuing through May 26th (although this is Las Vegas, so I have to think there will be quite a few people who extend their trip on either side, just don't tell their bosses). Citrix has gone through its fair share of changes over the last 12 months. So, what do they have planned for this year's event? How do they top the previous event? And what kind of new company and technology information should we expect to learn about at Synergy? To find out more ahead of the show, I spoke with Tim Minahan, Senior Vice President and Chief Marketing Officer at Citrix. Let's face it, it's been a wild 12 months for Citrix since last year's Synergy event. But things appear to be taking shape quite nicely for the company, and I expect we'll get quite the education as to the direction of the company for the remainder of the year and beyond during Synergy 2016. Things should prove quite illuminating. But on a personal note, the one thing I will definitely miss at this year's conference will be Mark Templeton. Not seeing and hearing him on the big stage or catching up with him 1:1 will be difficult after all these years. But that means that conference attendees will also get their first look at the new Citrix CEO, Kirill Tatarinov. Tatarinov, a 13 year veteran of Microsoft, where he was most recently Executive Vice President of the Microsoft Business Solutions Division, is putting the finishing touches on the company’s new plan. Expect to hear all about it during the keynote presentations.Citrix Synergy 2016 takes place May 24-26th and this year the venue moves to fabulous Las Vegas at the Venetian and Sands Expo. 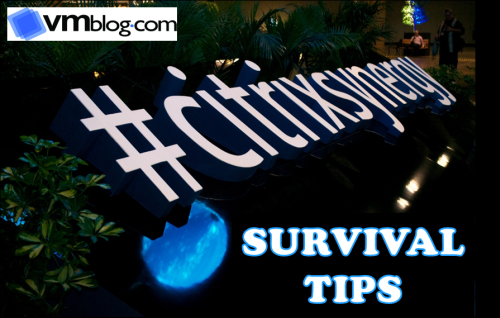 Whether this is your first Citrix pilgrimage made to Synergy, or, whether you are an old pro and card carrying alumni member, I'd like to share a few tips and tricks with you to help make your coming event as smooth and as successful as possible. I'm sure I'll miss a number of key tips or tricks, so please feel free to chime in to help others. AppSense is the leading provider of user virtualization solutions for the secure endpoint. The technology allows IT to secure and simplify workspace control at scale across physical, virtual and cloud-delivered desktops. AppSense solutions have been deployed by 3,600 enterprises worldwide to 9 million endpoints. The company is a subsidiary of LANDESK and has with offices around the world. For more information please visit www.appsense.com. Citrix Synergy is upon us again and this year they have relocated the conference to Las Vegas due to construction that is currently underway at the Moscone Center in San Francisco (their home for the past several years). This year will be the first Citrix Synergy conference since the departure of former CEO and President, Mark Templeton. VMBlog is fortunate to be attending and will be delivering videos and information from the conference that takes place from May 24-26 at the Venitian. VMBlog visits the UniFyle booth during Citrix Synergy 2015 and gets to see first hand how their product works. VMBlog stops in at the Atlantis booth during Citrix Synergy 2015 and gets a demo and product overview for their product Atlantis Hyperscale. VMBlog stops by the Lakeside booth at Citrix Synergy and gets an overview of their product SysTrak.